Can you see all four of them? This is not a good photograph. * I took it behind a window. 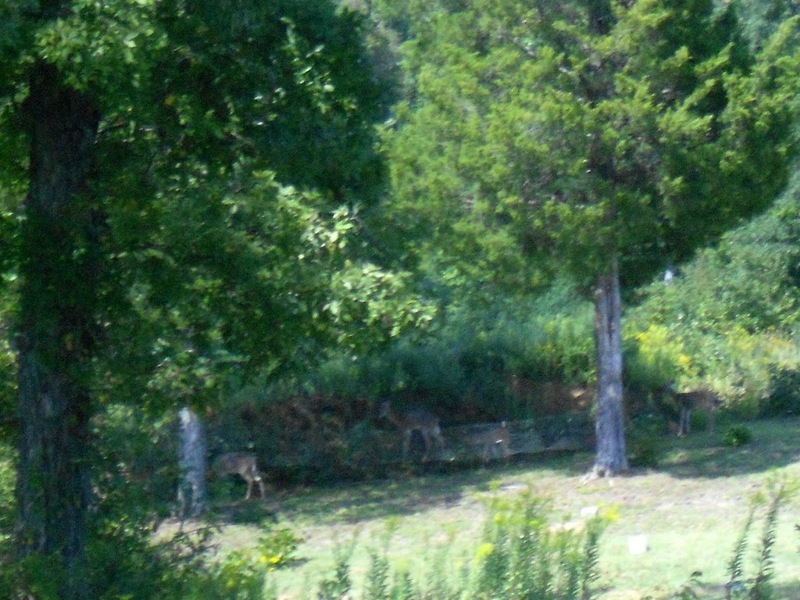 But still, if you zoom in you should be able to see four Odocoileus virginianus, white-tailed deer. Two are does, the other are fawns– they were probably born this spring. Why the post title? Look carefully. Between the two cedar trees is an expanse of chicken wire. On the chicken wire are a bunch of clothes pins that we use to attach pieces of paper to the wire. Behind the chicken wire is an embankment. That’s our shooting range! I can see it from my desk about 85 yards away. Note that “food” is a label. I will return to this in November. *If you are interested in amateur photography, check out Kat Landreth’s blog, Pare and Focus. I’m working through her tutorials and ebook (I’ll try to find the link, she sent me a draft). Pare and Focus: Her photography career started because she wanted to take great pictures of the food she prepared. She’s an excellent cook.